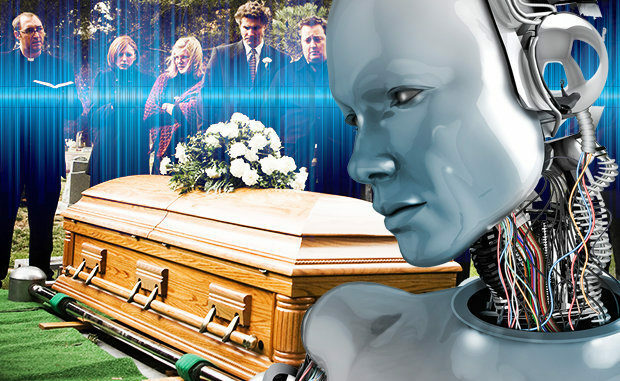 On top of planning your pension and future financial security, now’s the time to put money aside for downloading your brain data, according to a leading futurologist who says we’ll be attending our own funerals as robots by 2050. Dr Ian Pearson, who has a self-proclaimed 85 percent accuracy record when looking 10 to 15 years ahead, says humans will one day (and in the not too distant future) hook their minds up to external machines while alive to boost intelligence, improve memory and sensory capacity. External IT capabilities mean the technology can connect to your brain seamlessly so it feels exactly the same, says Pearson. Furthermore, the scientist says that when you physically die, almost all of your brain will still be functioning... as a machine. “By around 2050, 99 percent of your mind is running on external IT rather than in the meat-ware in your head," claimed Pearson in his blog, Futerizon. However, as humans have come to learn with personal data, the question as to who would own your proverbial brain after you’ve physically vacated the planet is an important one.